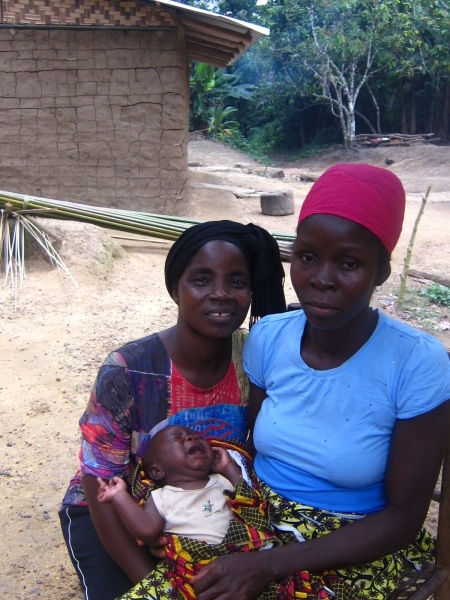 ejay Wonyou (left), a trained traditional midwife, persuaded Marthalin Dolo (right) to visit a health facility to prepare for a safe and healthy birth. Grand Bassa, Liberia—Marthalin Dolo, a 32-year-old mother of three children, had never visited a health facility for prenatal visits or to give birth. But when she became pregnant with her fourth child, she decided to break with the past and visit a health facility. She made this decision after talking with Jejay Wonyou, a trained traditional midwife who lives nearby. In visits to Dolo’s home, Wonyou explained to the expectant mother, her husband and her mother-in-law the benefits to mother and child of giving birth in a health facility with skilled care. Because the clinic was a three-hour walk away, she emphasized the importance of planning for a birth. “She told me that at the clinic the [midwife] would check and see if me and the baby were doing okay,” recalled Dolo. Equally important, Wonyou shared information with the family about the warning signs of postpartum hemorrhage and a medication that prevents excessive bleeding after birth—the leading cause of maternal deaths in the developing world. Dolo’s mother-in-law was familiar with the drug, misoprostol, which is known in the local Basso language as poweh and means “after pregnancy.” Wonyou told Dolo she could obtain the medication from the clinic when she reached her eighth month. Dolo’s mother-in-law—an influential voice in this traditional society—encouraged her to go to the clinic and prepare herself in case she was unable to give birth at the health facility. It was a strong endorsement of this lifesaving intervention, a key, community-based initiative to reduce maternal and newborn deaths supported by the Government of Liberia in partnership with the U.S. Agency for International Development’s Maternal and Child Health Integrated Program (MCHIP). Wonyou is one of 160 trained traditional midwives participating in MCHIP’s efforts to raise awareness about the importance of delivering at a health facility and preventing postpartum hemorrhage. This innovative program is part of a phased-in approach—implemented by MCHIP and Jhpiego in collaboration with the Ministry of Health and Social Welfare—to help save mothers’ lives. At eight months, Wonyou and Dolo visited the clinic together. The staff midwife counseled Dolo, who had experienced difficult births in the past, and provided her with misoprostol in case she couldn’t get to the health facilty to deliver. The midwife explained to Dolo how to store the medicine, when to take the pills, how many tablets to take and what to do with the empty pack. Wonyou also spoke to Dolo about the importance of family planning after the birth of a baby. Liberia is one of several countries in which MCHIP has rolled out the prevention of postpartum hemorrhage program with distribution of misoprostol at facilities and community-based health education. Liberia was primed for this intervention because of its high maternal mortality ratio (994 deaths per 100,000 live births), high rate of home births and limited access to health care facilities. These factors have contributed to the introduction of this lifesaving intervention into communities in Liberia at this time. The six-month program is designed to help the Ministry of Health and Social Welfare carry out its maternal health objectives by building the capacity of health workers to expand this innovative, facility- and community-based initiative throughout the country. When it came time for Dolo to give birth, even though the family had saved money for transportation to the health facility, none was available. Dolo gave birth with Wonyou at her mother-in-law’s house. As soon as the baby was born, the midwife checked to make sure there were no other babies, and Dolo took the three tablets of misoprostol as she had been instructed by the clinic midwife. As soon as transport was available, Dolo, her husband and their new baby traveled to the clinic with the empty packages of the medicine for a postnatal visit.